Costa Rica is a small country, about the size of West Virginia, but it's got massive appeal as one of the most ecologically diverse places on earth. Even though Costa Rica covers less than .03 percent of the earth's total surface, you can find nearly five percent of the planet's plant and animal species there. 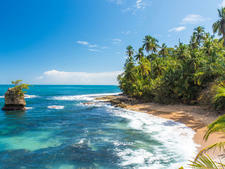 Its location -- between Nicaragua and Panama on the isthmus connecting North and South America, with the Pacific Ocean to the west and the Caribbean Sea to the east -- has enabled flora and fauna from both continents to thrive there. Cruise passengers visiting Costa Rica's Pacific Coast will come ashore in one of two places -- Puerto Caldera, a commercial port serving the nearby seaside town of Puntarenas, and Puntarenas itself. Puntarenas is a lively town that hosts josefinos (residents of the capital city of San Jose) on holiday, as well as international tourists. The main drag, a wide walkway fronting the beach that's jam-packed with places to shop and eat, is even called Paseo de los Turistas -- loosely, "stroll of the tourists." 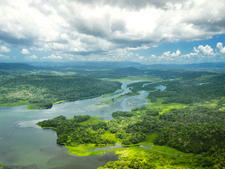 However, Costa Rica's real draw is its lush, natural beauty and biodiversity -- the "rich coast" after which it is named. Most cruise travelers use Puntarenas as a kickoff point for eco-adventures on the ground (horseback riding or hiking in the rainforest), in the water (kayaking, white-water rafting) and even in the air (zip-lining, an activity which originated here and is now popular throughout the Americas and the Caribbean). Some ships stop in Puntarenas proper, while others call in Puerto Caldera, a commercial port that's about a 20-minute cab ride away from the town. Both sit on the Pacific Ocean, on the west coast of Costa Rica. Some lines will use Puerto Caldera because it is protected by a windbreak, but both ports offer access to the same attractions and shore tours. 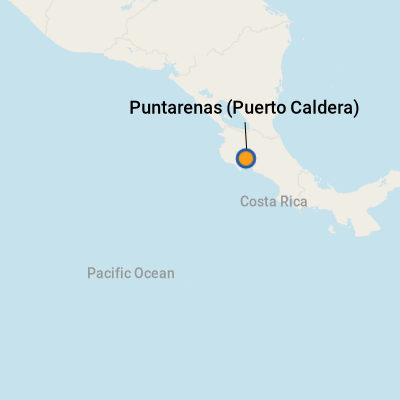 Puerto Caldera offers very few facilities for cruise passengers, and there's nothing within walking distance; again, the village of Puntarenas is a 20-minute cab ride from this port. Ships dock opposite a terminal building, at the far end of which are a few souvenir shops and a sitting area with restrooms. You'll be able to pick up gifts -- jewelry, wooden crafts, Costa Rican coffee -- from local vendors but no food or drinks; spring for the bottled water for sale onboard your ship if you'd like to carry something with you. If your ship docks right in Puntarenas, however, you are steps away from the base of the main tourist drag -- Paseo de los Turistas, which is a wide walkway replete with shopping and dining options that runs parallel to the beach. There's also a cruise terminal across the street from the dock perimeter with restrooms and other facilities, including phone stations. The port offers complimentary shuttle service from the gangway to the main exit if you don't want to walk; it's about 250 yards. Petty theft can be a problem; use the same common sense precautions as you would anywhere else in the world. Leave whatever cash and valuables you don't need behind, or conceal them appropriately. From Puerto Caldera: The nearest town of interest, Puntarenas, is a 20-minute taxi ride away. The cost at press time was $25 one way for two passengers ($15 for one) or $50 roundtrip -- and the driver will either wait for you or come back for you, collecting payment back at the pier. We recommend taking only "official" taxis, which are always red with a yellow triangle on the door. There's also a colorful bus that offers a two-hour roundtrip guided tour into Puntarenas for $20 per person. The tour offers quick visits to the fish market and local cathedral. If you aren't interested in going into town, we recommend booking a tour, either on the ship or from an independent operator. Tour operators also show up on the pier to sell to those folks who want to see Puntarenas with a guide or experience eco-tours -- zip-lining, rafting, etc. -- independently from their cruise line's shore excursions department. From Puntarenas: Ships deposit passengers onto the Paseo de los Turistas, where taxis line up. The local currency is the Costa Rican colon; on our trip, approximately 540 equaled $1 U.S. Check a Web site like XE.com for the latest exchange rates. However, whether you are visiting for a day or for a few before a cruise, you don't necessarily have to change money; vendors and taxi drivers are happy to accept U.S. dollars. Just note that you'll likely get change in colones -- so you may not want to break big bills. Banks are generally open from 9 a.m. until 3 p.m., Monday through Friday. Spanish is the official language, though taxi drivers and other ticos (locals) working in the tourist areas speak at least some English. Grabbing a bite to eat in Puntarenas is easy -- there's a string of open-air food counters, called sodas, as you walk along the Paseo de los Turistas. They offer ample seating on wooden benches, shaded by overhangs. Sandwiches, such as cheese (queso) and ham and cheese (jamon con queso), start from about $2 -- or 1000 colones; the vendors will take U.S. currency. Not surprisingly, as this is a seaport, fried fish and ceviche (citrus-marinated seafood salads) are also staple items at the sodas. Costa Rica is known for its smooth, balanced coffee, considered among the best in the world. Cafe Britt is a famous producer, and you'll be able to find bags of its coffee, whole-bean and ground, in most gift shops (along with locally made chocolates). However, pretty much any brand you pick up will be excellent. We like Cafe Tres Generaciones.